I’m driving now after a little shopping trip. I’m following up on my last podcast and talking more about data, not drama. Today we’ll talk about scorecards. What needs to be included on your scorecard? I’m going to tell you the minimum data you need for one. How many sellers did you talk to? How many buyers? How long did you talk to them? How many leads are you getting? Are you making offers? Are they being accepted? Hey guys, good evening. How you doing?I am driving in my car on my way home from World Market. My goodness what a zoo. I do not like shopping. I’m not going to complain, but this is, this World Market is in a area of town where there’s a lot of shopping, you know, it’s like a lot of stores and stuff around there. And there’s one little tiny parking lot is in the center of these 12 huge monstrous stores and it’s just insane to find parking to get in and out of there and it’s just crowded too many people and the only reason I’m there is because I love my wife so much and she asked me to go out of my way to get some stuff for her so she wouldn’t have to go there. So yeah, my wife is pretty amazing. She asked me to do anything. I’ll pretty much do it. Okay. So why am I doing this? Okay. 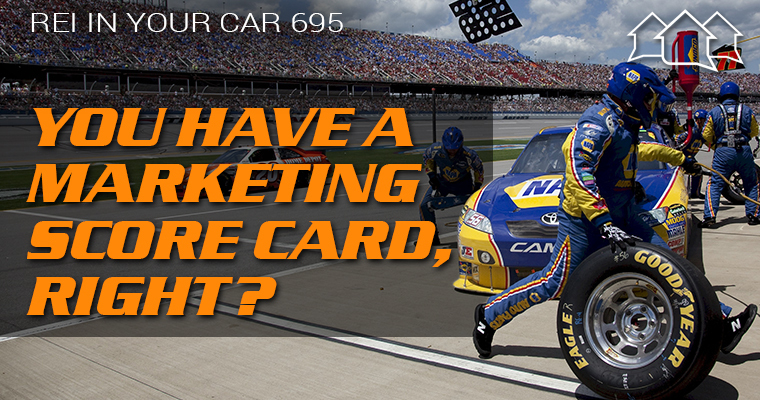 I wanted to talk about the three things that you’re marketing scorecard needs to have. I was talking in my last podcast about data, not drama. You know, like if you don’t know your numbers, you don’t have a real business. So you need to track your numbers and what are really the three at a minimum, what are the three things you need to be tracking on your scorecard every day or just, you know, every week, what are the three things? Well, number one, working backwards. You want to do deals, right? So how many deals have you done in the last week, in the last month? Then how many offers did you make so then you can get a number of offers per deal. How many offers did you make? Then number three was that three is how many sellers did you talk to? How many sellers did you talk to? Then number four is how much marketing did you do? So I think I said three things at the beginning. Those are four things. Number one, how many deals did you do? And of course related to that is you’re profit, say average profits per deal. But then next is how many offers did you make to get those deals, and then number three is how many sellers did you talk to to get to that many leads to get to that many sellers to make offers to. And then finally how much marketing you do to get that? I was just talking to a coaching client recently and you know, he’s kind of little bummed because he said it just doesn’t work in his state. He said, I hear all these other people talking about how this stuff works in their state, but it doesn’t work in my state. And of course everybody thinks that their state is unique and if I listened to every student that told me it doesn’t work where they live then it wouldn’t work anywhere in the United States. I’ve said this before, a lot of times, like one time I had the same day or within two days of each other. One student in the same city tell me I have tons of sellers, but no buyers. There’re no buyers in this market. Then the same day after that, I had another guy call me and said, I have tons of buyers but no sellers, this doesn’t work in the same city, a couple of days of each other to different people, so it’s crazy, right. It’s just a matter of perspective. Maybe it’s just mindset. So I told this guy said, all right, give me your numbers. Show me your scorecard. How many offers have you made in the last four weeks? How many sellers did you talk to to get to those four offers and what kind of marketing did you do? That’s really kind of get you got to know your numbers because if you figure out, okay, well I made 20 offers and didn’t get those 20 offers. I talked to 40 sellers and to talk to those 40 sellers I had to do this amount of marketing. Then you can figure out what’s going on. Maybe your offers are way too ridiculously low, right? Maybe your offers are just weird, like they don’t make any sense. You’re offering them this and this and this and this. You just maybe need to be focusing on one thing. You can’t figure out what’s wrong until you know your numbers. If you’re making a lot of offers, and you’re talking to a lot of sellers maybe you’re not saying the right things. Maybe you’re not prescreening them enough. Maybe your prescreening them too hard. Maybe you’re spending way too much time talking to sellers on the phone. I mean, if you’re spending an hour on the phone with a seller to only to find out they don’t want to do a deal or you’re miles apart on your numbers, then you’re talking way too long and you’re saying the wrong things, so we need to work on what to say to sellers. Maybe we need to learn on work on your confidence. Pulling away, right Instead of pushing, instead of trying to sell, turn the tables and get the seller to sell you, instead of always selling, you need to be sold. You need to be the reluctant buyer. Right? Or maybe it just comes down to you’re not getting any leads because you’re doing the wrong marketing, or maybe you’re doing the right marketing to too small of a list. You need a bigger audience. Maybe it’s just you need to go out into other markets, maybe your market is too small, maybe you need to go out into bigger, wider markets. All comes down to this. Your speed to income is directly proportional to the number of offers that you make. And if you want to do deals, you got to make offers, right? And, and this particular client in particular, he hasn’t responded to my last message I sent to, but I suspect he’s just not been making enough offers and that’s fine. Let’s figure out why haven’t you been making enough offers. Well the marketing’s not working? Okay, well, what marketing are you doing? Do you see where I’m going? I don’t want to repeat myself, but I can. I can totally help him if he knows his numbers and he’s able to tell me the data. Give me the numbers. How many, what have you done? The ultimate goal guys, you should make it a goal to talk to five sellers a day. Make at least three offers a day. If you can make an offer to every seller you talk to, that’s awesome. That’s what you need to be trying to do, make offers to every seller you talk to. If you talk to five sellers day, even if they say no, right, send them an offer anyway. You have the address of the property, pull up the owner’s mailing address and mail them an offer or just a letter that says, Hey, it was nice talking to you. I know you don’t want to sell your house now, but listen, if circumstances change, let’s talk and attached is an offer that I might be able to make on your property or attached are some options or something like that. You get what I’m saying? So send offers and send a lot of them and follow up follow up. Almost 80 percent of our deals come from a seller that says no the first time we talked to them, just the way it is, it’s follow up on average were two to three months from initial contact to actually getting a deal under contract on average five to seven follow up touches. So it takes time. It takes patience. You got to make a lot of offers. It takes time to build that momentum up. Don’t get discouraged, don’t quit. Just keep on pressing forward or I lean in. When you get discouraged and it’s getting hard and you’re getting depressed and you want to complain, lean in harder, work harder, push harder. Don’t quit. Stop farting around and stop being a sissy. Okay? All right guys. We’ll see a later. Go get you some offers.